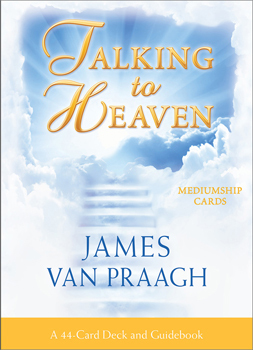 Previously published as Talking to Heaven Mediumship Cards by Doreen Virtue and James Van Praagh. Your loved ones in heaven want to talk with you, and share their love and reassurance to help heal your grief. With these Talking to Heaven Mediumship Cards, you can ask a departed friend or family member a question and receive answers through the 44 beautiful cards in the deck and the messages in the accompanying guidebook. Drawing upon James Van Praagh's years of experience as a clairvoyant and spiritual medium, this deck offers you a healing tool to facilitate clear conversations with heaven.